In October 2014, Jeronim Capaldo from Tufts University published a working paper on the Transatlantic Trade and Investment Partnership (TTIP) which he subtitled European Disintegration, Unemployment and Instability. 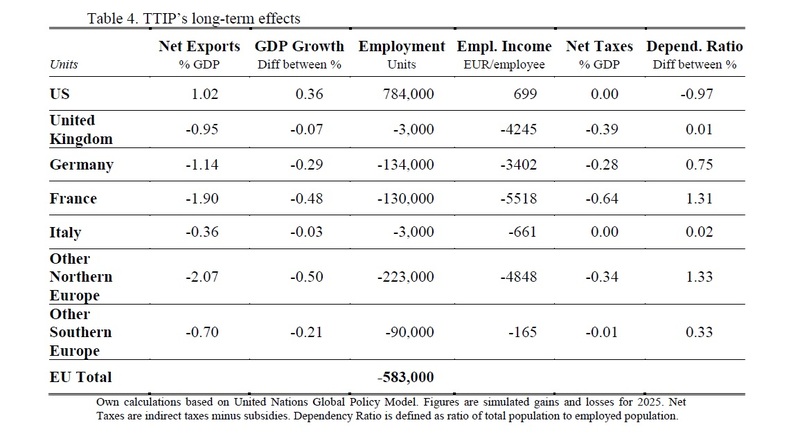 In the paper, Capaldo puts into perspective the results presented by the promoters of the trade agreement and says that “the main studies of TTIP are not a good basis for policy decision as they rely heavily on unsuitable economic models.” He proposes an alternative model, the United Nations Global Policy Model, in order to estimate more realistic effects in case TTIP is implemented. The least we can say is that his findings, though they require a certain economics knowledge, are unambiguous. Capaldo discredits the results advanced by advocates of TTIP by rightfully stating that their estimated increase of European GDP by 0.5% (over a period of more than 10 years, up to 2027) is negligible and not worth losing on other aspects. Make yourself an idea by reading Capaldo’s writing paper.